Today's post is in celebration of Spring, and who better celebrates the seasons with food than the animals at Redwall Abbey! Seriously, these little dudes have feasts all the time and the way English author Brian Jacques (1939-2011) wrote them you'll drool with every word. 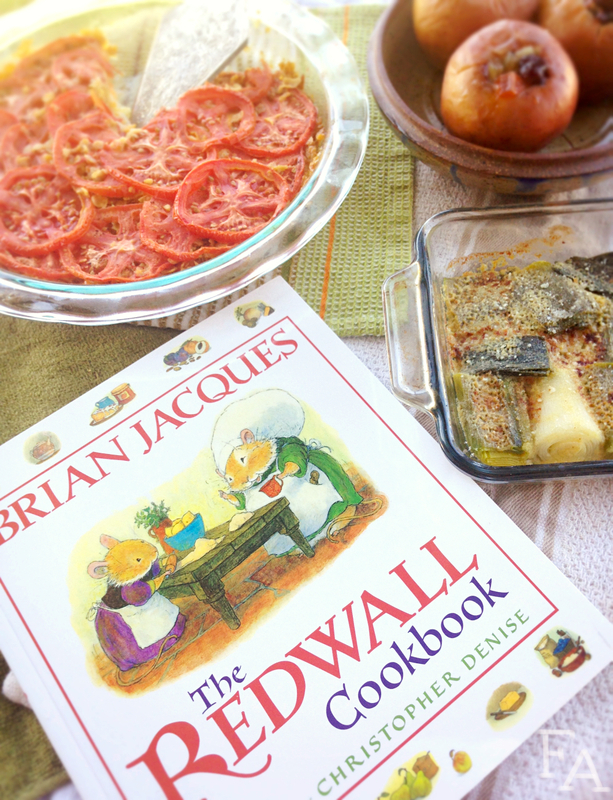 Thankfully there is a wonderful little cookbook, published in 2005, written by Jacques and illustrated by Christopher Denise (The Great Redwall Feast, A Redwall Winter's Tale). Denise's illustrations are soft and warm, just like the creatures they depict. This cookbook is not only filled with yummy foods from the series but is also a story that follows a pretty little apprentice cook mouse maid through the seasons of feasts as she learns Abbey recipes and comes up with a few of her own. Spring, Summer, Autumn, and Winter are all represented with vegetarian recipes using produce that is appropriate to the season. The story is filled with a cast of friendly and familiar characters who at various times pipe in with their favorite dish or mention a dish or two that is common to their animal kind (i.e. moles, hares, etc.). After we progress through the year and the little mouse maid's journey in the kitchen, we (and she) are given a sweet and rewarding ending. 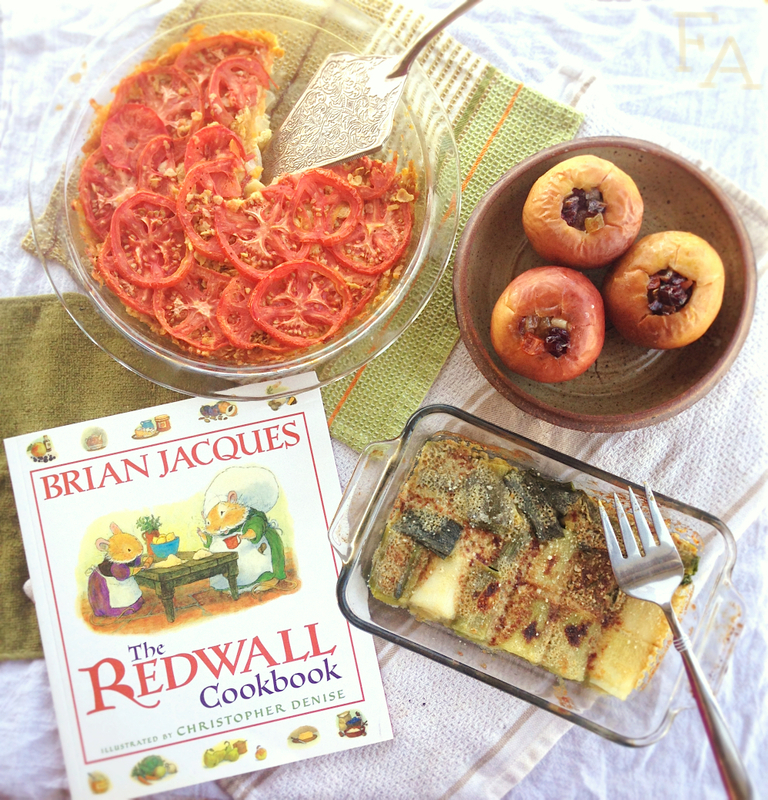 The Redwall Cookbook (104 pages) features easy-to-follow recipes for appetizers, side dishes, main courses, desserts, and drinks for each feast (four feasts total), and is organized both in story and in the table of contents by season. There is a beautiful illustration on each page, some small to accompany a bit of text and some large to depict an entire scene. 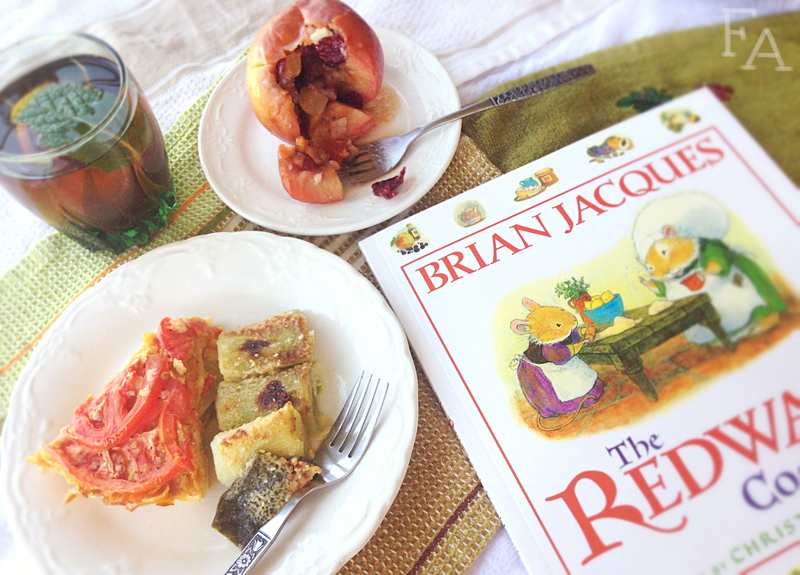 The story is preceded by a short introduction by Brian Jacques on why he included such sumptuous food descriptions in his Redwall stories and each season section is prefaced by a time-of-year poem and an accompanying page+ illustration. 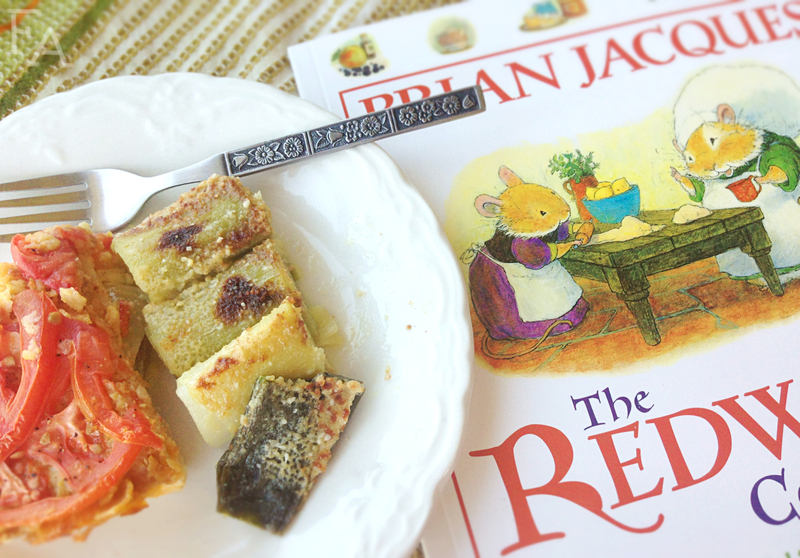 At thirty-seven delicious and very doable recipes plus the lovely and cozy illustrations and story, this cookbook is definitely a great value for fans of the Redwall series and can even stand on its own for those who are being introduced to Redwall for the first time. Click here to read my Brian Jacques "In Memoriam" post from early 2011. 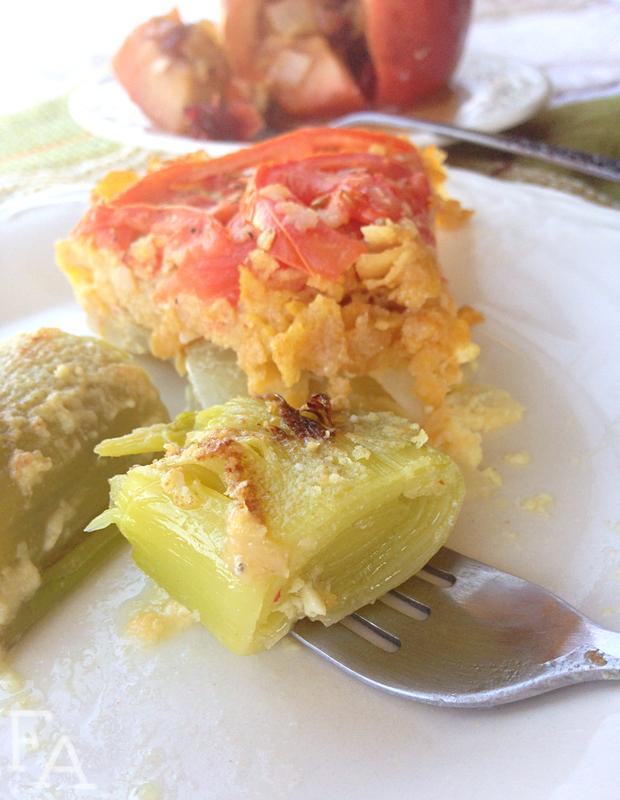 "In my stories, the food has as much a part of the saga as the battle, the quest, the poems, the riddles, and the songs. So enjoy it, mates!" 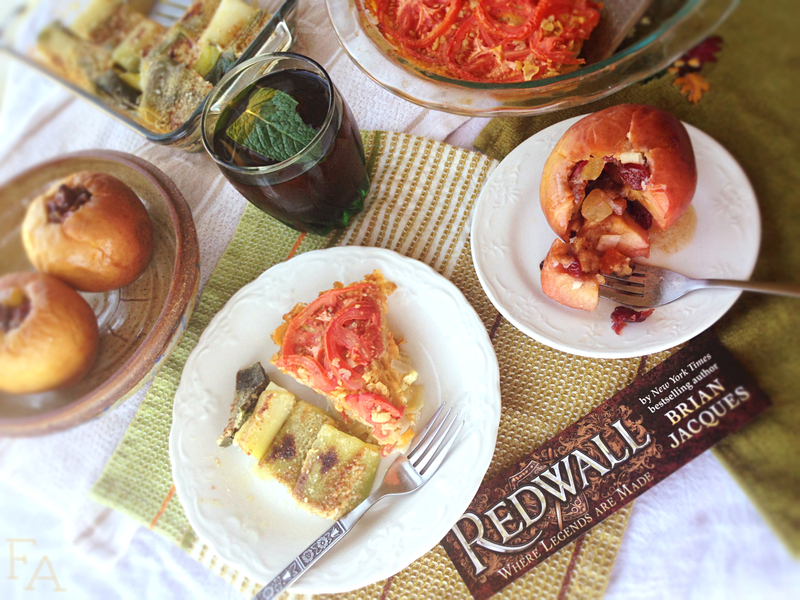 Note: The four recipes below are a small selection from the Springtime section of The Redwall Cookbook (hence the "mini" in the post title). The directions are written in my own words. 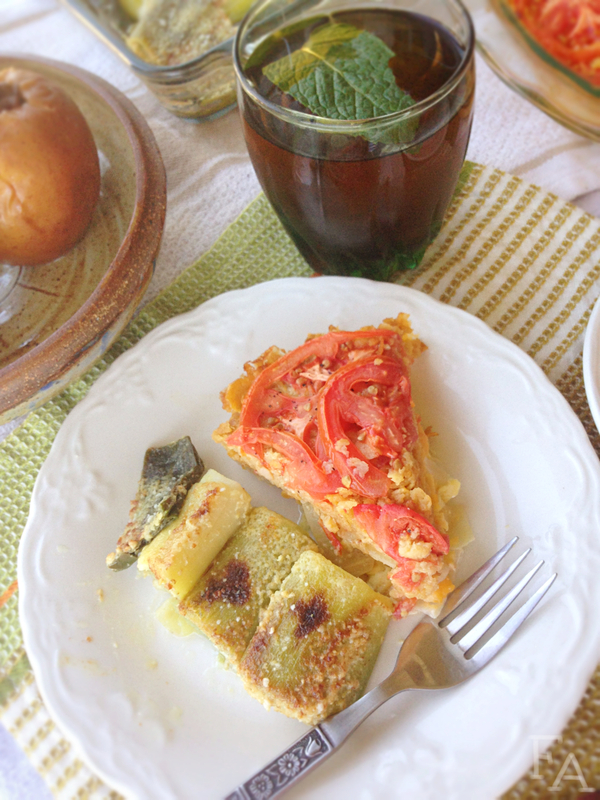 There is one main dish, one side (or two mains, however you like), one dessert, and one drink. If you're going to make them all, for your own little Springtide Sunfeast, the Hogbake should go in the oven first, followed about 10-15 minutes later by the honeybaked apples—if you want them on the table at the same time. If you want the apples strictly and separately for dessert, put them in the oven right before you sit down and have them baking while you eat. 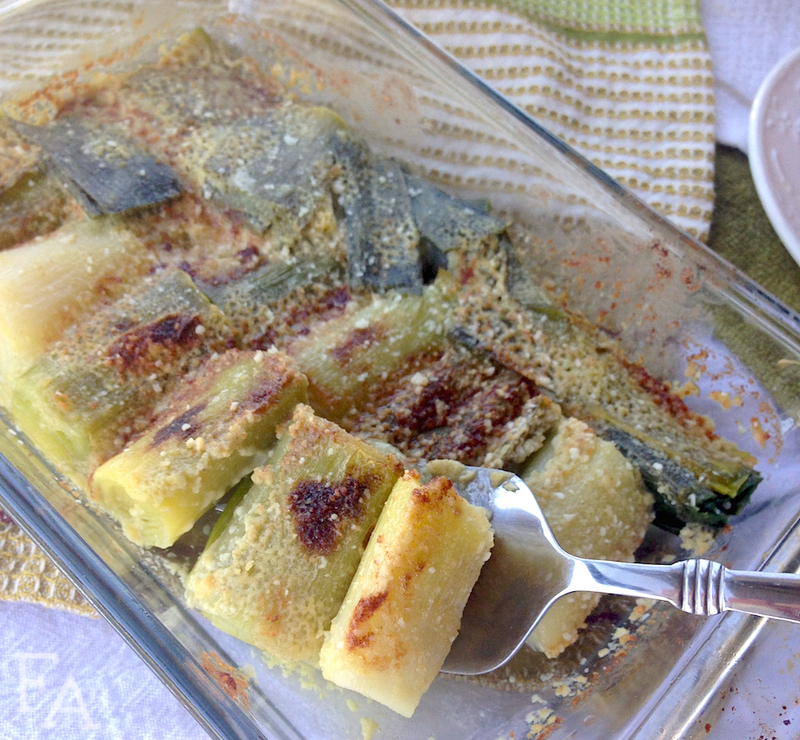 For the leeks, because they only take a few minutes to cook under the broiler, have them in their casserole dish and ready to bake as soon as the Hogbake is pulled from the oven. Depending on if you want the mint tea hot or chilled, make it prior to the hogbake (chilled) or begin making it a few minutes before you pull the Hogbake out of the oven (hot), and finish it up while the leeks are under the broiler. 1. Preheat your oven to 350°F. 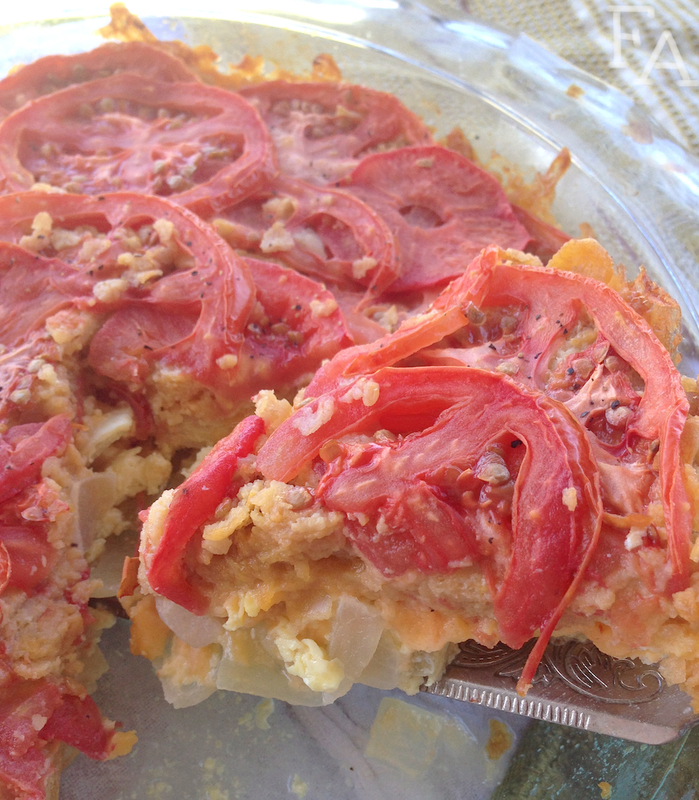 Place the chopped onions in a large baking dish (instead of a rectangular casserole dish, I used a 9 1/2" glass pie dish) & then cover with grated cheese. In a liquid measuring cup measure the milk & then add the 4 eggs. Whisk well until the eggs are completely broken up & incorporated into the milk. Add in salt & pepper to taste & then pour the mixture evenly over the cheese & onions. Next, sprinkle on the crushed corn flakes (I simply crushed them by hand in a plastic baggie) & then layer on the sliced tomatoes. Sprinkle a little more salt & pepper if desired & then bake on the center rack for about 40 minutes. Serve warm (although Ambrose Spike says he "likes a chunk when it goes cold"). 1. Preheat your broiler. Bring a large pot of water to a boil. Prepare the leeks by peeling off the outer layer of white & leaves & then slice them into 1 1/2" lengths, greens included. Place the pieces in a colander & rinse them off, making sure to clean off any dirt. Place the leeks in the boiling water, sprinkle in a little bit of salt, & let cook for about 10 minutes. Drain the now tender leeks & then place them single layer in a casserole dish. 2. In a medium bowl, cream the softened butter with a hand mixer until fluffy (I actually used ~3-4 Tbsp. of butter 'cause, butter!). Add in the dijon & grated parmesan & mix until fully incorporated. Spread the butter mixture over the leeks. Sprinkle on a little salt & more parmesan if desired & then place under the broiler for about 3 minutes or until the butter spread is golden brown. Serve warm. 1. Preheat your oven to 350°F. Butter a baking dish large enough to fit the apples (whole). Core the apples to within about 1/2" of their bottoms (meaning, don't push through the bottoms when you're taking out the cores!). Stuff dried fruit into the apples (I scraped around inside the apples a little bit before I stuffed them to make more room for the fruit) & place the stuffed apples into the baking dish. 2. 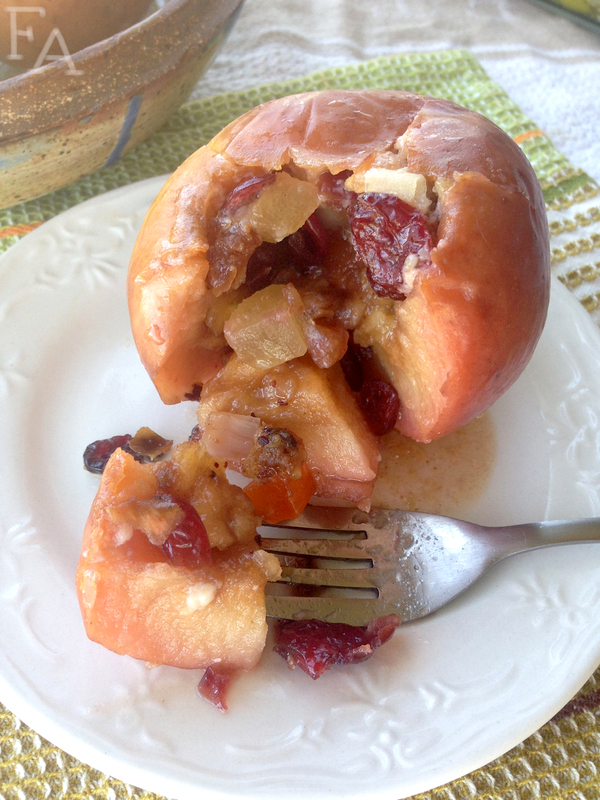 Heat the honey in the microwave for about 10-15 seconds until runny & then spoon it into/onto each apple, over the fruit. Pour enough water into the baking dish to go up the sides of the apples about 1/2". Cover the dish with foil & bake on the lower rack for about 25-30 minutes. Serve warm with a drizzling of heavy cream. 1. In a medium pot, bring the water to a boil & remove from heat. Add in the tea bag & mint leaves & let steep for 5 minutes. Strain into a pitcher or directly into serving mugs or tea cups. 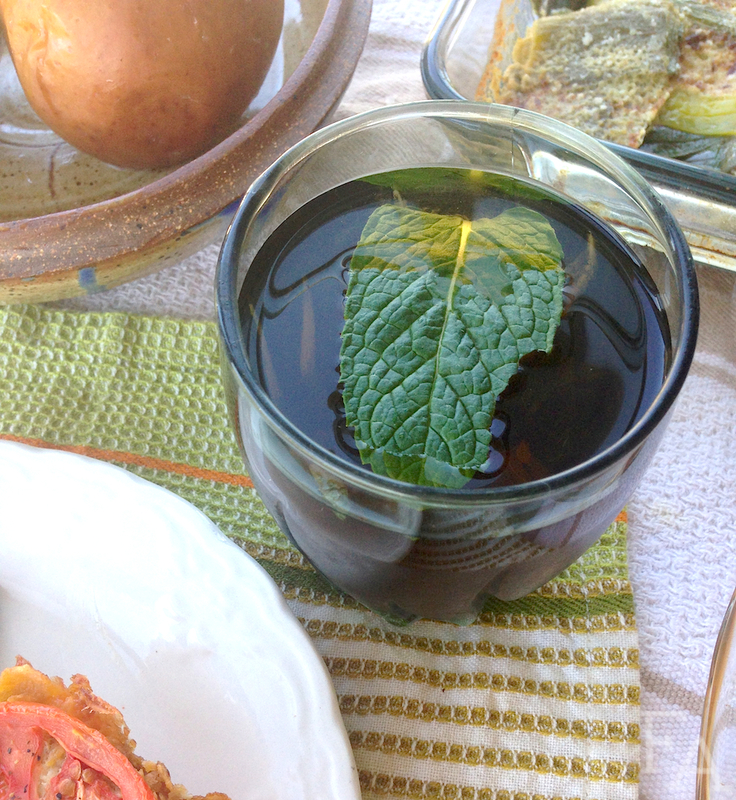 Add honey as desired (or none at all) & garnish with a fresh mint leaf. Note: Alternately, you can serve this chilled by simply placing the finished product in the fridge or freezer for a little while. This is how I like it if it's with savory food. I'll take it warm with dessert though. I actually went out to find this cookbook at my barnes and noble. XD. there was only one. Do you think I could use cornmeal instead of cornflakes for the hogbake? I guess it wouldn't have the same crunch but maybe I could make a breading? It looks amazing! Thanks for the pictures.